John Hummel scored a last-minute try to secure victory for Boston Rugby Club at North Hykeham, writes John Fletcher. He concluded the scoring in this feisty encounter by touching down in the corner following a flowing backs move to earn a dramatic away win. Boston stay in sixth place but are now just eight points adrift of their opponents, who sit a place higher in the Midlands 4 East (North) table. From the start, Hykeham were up for the encounter and looking to secure a second win against the visitors. In perfect playing conditions, the opening exchanges saw both teams look to play expansively, but it would take 25 minutes for the deadlock to be broken, Boston captain Lewis Eldin finishing off a break from scrum half Josh Cook to score under the posts. Bray’s conversion put the visitors 7-0 in front. Boston conceded a penalty from the kick-off to see the lead reduced to 7-3, and a try from the home side five minutes later saw them move ahead. A long-range penalty by Bray on 35 minutes put the visitors 10-8 up at half time, before head coach Ashley Coates made one change, bringing on Hummel for Kyle Turley on the wing. Within two minutes of the restart a series of mistakes saw Boston concede a converted try, the home side moving in front 10-15. At this point Luke Fowler and Joe Deamer replaced Steve Kippax and James Griffin in the back and front row respectively. The match would spring into life when, from a break by centre Charles Hughes, the ball was recycled by back row Dave Cotton-Betteridge to see winger Harry Woods score. Bray’s conversion moved the Blue and Whites to within one point of their opponents with 20 minutes remaining. 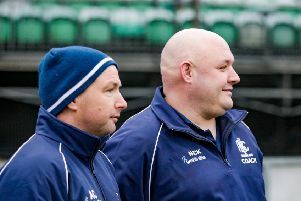 Bruno Hall and Sam Hughes were sent on to replace Michael Baldwin and Paul Beard. In a dramatic last 10 minutes, Hykeham added a further penalty to move 17-21 ahead before two yellow cards saw the home side reduced to 13 players. And in a grand finale, a set-piece scrum would provide the foundation for the final winning score. Boston’s man of the match was scrum half Josh Cook. BOSTON: Hough, Beard, Griffin, Sharpe, Eldin, Cotton-Betteridge, Scupham, Kippax, Cook, Bray, Turley, Baldwin, Hughes, Woods, Hobbs; replacements: Deamer, Hummel, Hughes, Hall, Fowler. On Saturday, the squad entertain Nottinghamians in the league and the Development side host Lincoln University (both 3pm).